Established in 1979, we Kiran Rubber Industries Private Limited, are one of the renowned manufacturers and exporters of Molded and Extruded Rubber Products. Manufactured using latest technology, these products are efficient in performance and highly durable. We design these products in accordance with the ISO standards, regardless that we are not ISO certified yet. Further, to meet the technically advanced requirements of our international clients, we customize these sheets in various sizes and thicknesses. For manufacturing these products, we have developed a vast infrastructure that is well-equipped with latest machines and equipment. At this infrastructure our manufacturing units, quality unit and R&D unit works in close coordination to achieve the desired objective. Our organization has gradually made its position in the global market with its hold on delivering quality products with a constant pace, without compromising on any shortcoming that came across. Our team of dynamic professionals enfolds managers, sale and marketing executives, technocrats, procurement agents, and other skilled and semi-skilled workers. They all have amazing capabilities to execute their respective tasks competently. Under the aegis of our CEO Mr. Kiran Bhayani, we have established a commendable status all over the country. It is owing to his 35 years of experience and continuous support that we have earned recognition in the photography industry. We are one of the renowned names in manufacturing and exporting superior quality molded and extruded rubber products. Our wide range includes Rubber Sheets, Rubber Expansion Bellows, Silicone Rubber Products, Hose Pipes and Coated Fabrics. Further, we also offer Safety Equipments & Products, Molding Products and Extruding Products. Manufactured using latest technology, these products enables us to meet the dynamic changes in market. These products cater to the needs of various industries such as Constructions, Engineering & Mechanical Industries. ‘’Our aim is to achieve growth in our segment and become one of the best suppliers of quality rubber products in the domestic as well as the international markets. We are striving to cater to a wider area in domestic market as well as international market’’. Apart from these industries, our range of sheets also finds applications in Agricultural and Medical sector. An ISO 9001:2008 Certified Company . We are one of the leading manufacturers & exporters of Molded & Extruded Rubber Products. These Rubber Sheets, Hose Pipes, Moulding Products etc are appreciated for their temperature resistance, shock absorbing capacity & strength. 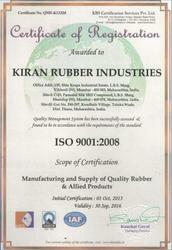 Experience from 1979, we, at, "Kiran Rubber Industries ." are engaged in offering a wide range of rubber products that includes Rubber Sheets, Rubber Expansion Bellows, Silicone Rubber Products, Hose Pipes and Coated Fabrics. Further, we also offer Safety Equipments & Products, Molding Products and Extruding Products. Manufactured using latest technology, these products are efficient in performance and highly durable. We design these products in accordance with the ISO standards. We are registered ISO 9001:2008. Further, to meet the technically advanced requirements of our international clients, we customize these sheets in various sizes and thicknesses. These products cater to the needs of various industries such as Constructions, Engineering & Mechanical Industries. it is because of our committed services and timely deliveries that we have gained huge clientele all across Kuwait, Jordan, USA, Europe, East Asia, Middle East, Australia and China.Some of our major clients are Reliance Industries Limited (All over India), BPCL, BARC, Central Railway, Sesa Goa and Uttam Galva Steels.